This Christmas t-shirt is all about penguins and if you like these black and white birds then you should check this shirt out. On the t-shirt you can find a circle that is light blue in color and in it you can see two cute penguins on a patch of snow and the birds have a candy cane and are wearing red and white Santa hats. 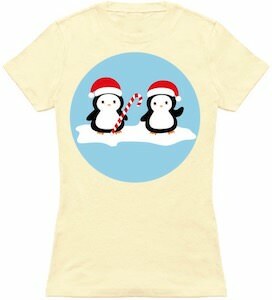 You can get this fun penguin Christmas t-shirt in styles for men and women and in sizes Small – 6XL. And besides the cream color of the picture you can get the shirt in many more fun colors to match your outfit perfectly.